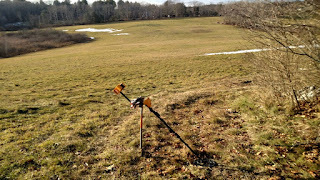 It has been months since the ground froze hard here in Maine, and I'll have to wait until April before I can dig again. So All I can do is look at all my "treasure", and enjoy the memories. Last year I found a number of keys, mostly on the flea market site that I was detecting on throughout the year. 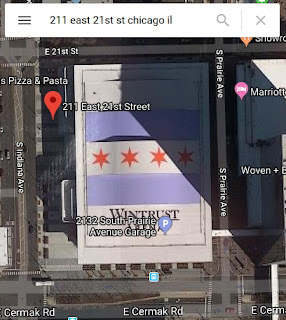 I looked up the address, and that location is now the site of the Wintrust Arena. The address appears to be a brownstone in Brooklyn now. I imagine it may have been a small key shop a while back. I can't imagine how tiny the key would have been! The top one is plated zinc I think. I haven't been out digging for a month now, mostly because I have been busy with work (I design electronic products for a living, mostly). 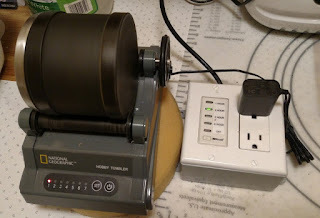 But also because it snowed several inches before Thanksgiving and the ground froze, so I mothballed my equipment. Today however, the snow all melted and the ground thawed to the point of being muddy. I decided to go out in the hay field across from my home. I have not had high expectations for this field, but then I watch Jocelyn (Relic Recoverist) and Drew's (Naughty Dog Treasures) YouTube videos and realize that they always find cool stuff way out in open fields along the East Coast. So I figured "Why not" today and roamed out in the fields going with the vibe of what felt right. 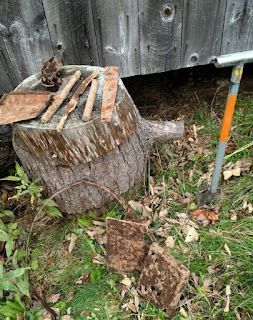 My first finds were some old square nails and a big steel chunk that looks like it was part of haying equipment. But then as I worked out farther I got a strong signal that read as long an narrow. It was part of an aluminum hunting arrow. I found parts of 3 arrows all broken up in the same area. They were angled down ranging from a few inches to over 9" deep. Maybe they were lost to target practice, or someone trying to bag a deer and missing? 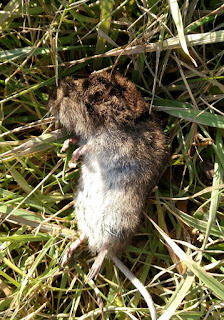 A little further on I came across this dead mole. 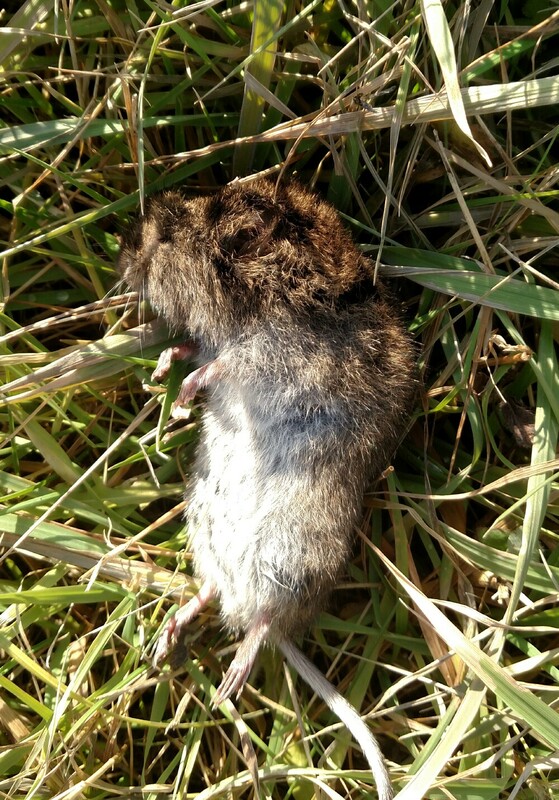 It looks quite large and hopefully died of old age. It looks very peaceful. I worked my way up to the top of the rise at the highest point in the field where I had found rifle shells, can slaw and lots of pull tabs in the past - this was a picnic spot at some point. I took the picture below looking back across the field to my house that is hidden in the woods. Shortly after I took this picture, I got a good strong silver signal and pulled up this silver ring. It is junk jewelry that tests as 80% silver. It was made from a strip and bent around and joined and the pattern does not match. There is no makers mark. A little later I found this steel ring that was probably from horse tack. 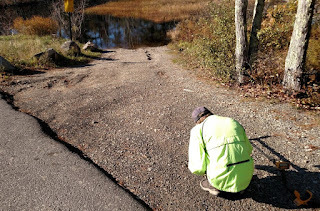 It was great to get out on a relatively warm, sunny day, even though it was rather muddy! This is the latest in the season that I have dug since I don't like digging in cold or snow. I'll be doing a season wrap-up next that highlights my favorite finds of the year. I'm back to the 1700s property. The owner clarified for me that the original 60 X 80ft. barn built in the mid 1700s is no longer there, and the house was built in the early 1800s. This was after I had spent 2 hours digging around the new barn attached to the house. 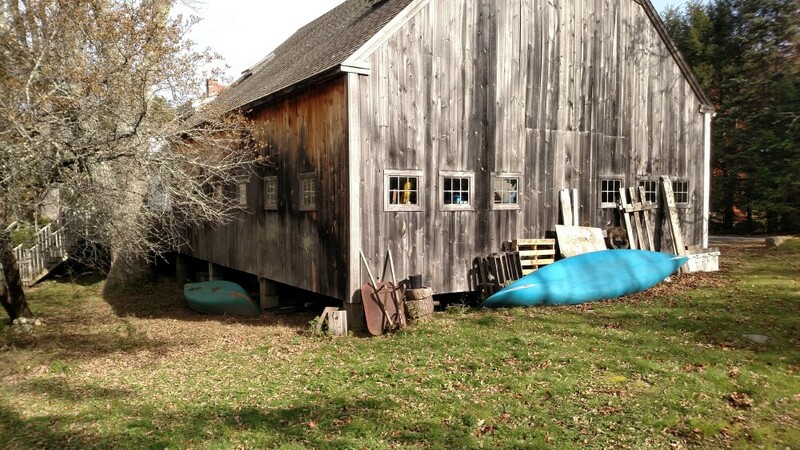 They had built this in the late 1990s and it's an nicely made barn that they seem to use for working on boats. They have a lot of boats large and small. Here's a view of the barn and the area I was digging. I kept hoping for coins or buttons, but all I got was big signals of iron and steel. I put them on some cut stumps next to the barn as I found them. Mostly scrap flashing, brackets and pipe from old buildings, but also a heavy wheel and something resembling a lamp part. The interesting finds are this 1934 Maine license plate. And this heavy cast iron piece looks like a wood stove part. These will go in the pile of scrap steel that I'm accumulating along the side of my barn. Someday I hope to recycle this stuff. I'll go back and explore around where they say the original mid 1700s barn was as soon as the weather is amenable, the next few days will be rainy again. The weather was warm enough and not raining for a change so I went back to the early 1800s farm house near me that has an attached barn built in the 1990s. This time I stuck close to the barn and found more signals than I had time to dig. But I definitely got a few goodies. 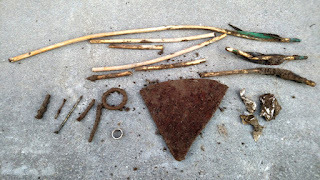 The dirt is loose and easy to dig, but I had to go over 6" to get most of today's finds. Big pieces of steel and copper from the barn and a huge square steel nut. I'm not sure what the spoons are made of, but they are very soft and seem to have been plated originally. 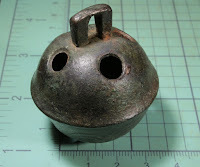 The best find for me was the second crotal bell that I have ever found. The clapper is missing so it does not ring, but it's a beauty with fancy decoration. This is definitely bronze and not brass. I showed it to the property owner and she was intrigued, we both hoped it would ring. I cleaned the dirt out in her work sink, but sadly the clappers in crotal bells tend to be steel and rust out. But when I showed her the oarlock, she recognized it immediately as one she had lost about 15 years ago when she was pressure washing a dinghy. She still has the matching one and was glad to have this back - after I cleaned and photographed it. I also found a small sterling owl pin. I'm hoping to go back tomorrow since the weather is giving us a break between rain and wind for a bit. There is a boat ramp near my home where folks put in their kayaks, and I launch my hand made wood canoe. It's a scenic spot with gravel on the ramp that adjoins a 2-lane blacktop. It was sunny and warm enough to go dig, and as I was driving the 1/2 mile to the ramp I encountered my friend and neighbor John who was out for a walk. 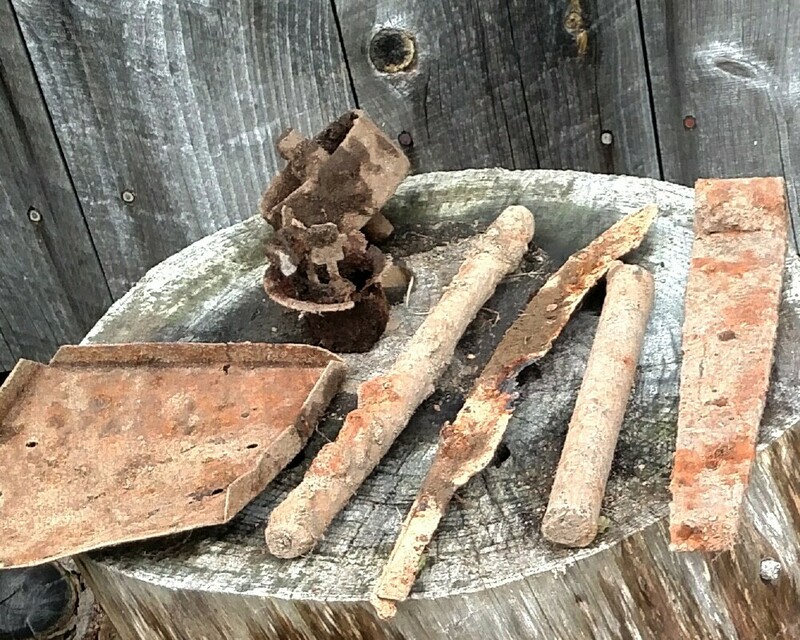 He and I have metal detected on his property where there is a old cellar hole from a barn. I invited him to join me on a dig. We found a lot of "stinkin' Lincolns" and a dime and a nickel. Nothing too exciting. But we also found 5 .45caliber pistol shells clumped together in one area. (Chief Deputy Sheriff Brett, if you're reading this, maybe there was a murder here!😟) There are different types, so I assume these were re-loads. Those are BIG! Here's a shot of John digging up something on the top of the ramp near the road. We also found a bunch of junk that I don't bother to show like cans and bits of rusty metal etc. This object looks like a face, but I think it's some kind of lock or latch. 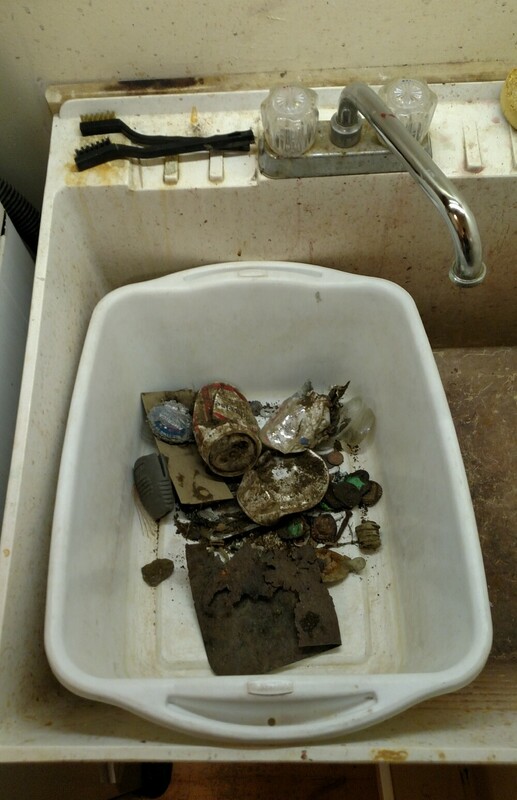 When I get back I dump all my finds into a bin in my laundry room sink and sort everything into coins for cleaning, recyclable metals, special objects and trash. 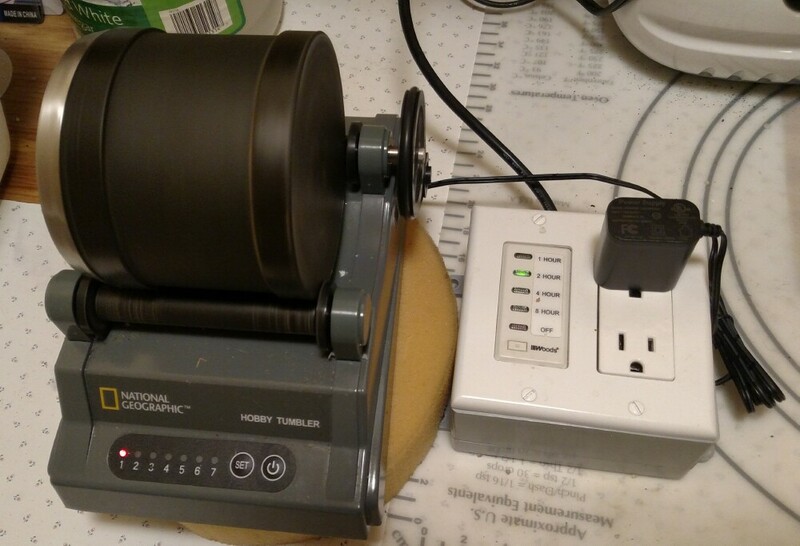 Coins go into my tumbler for an hour or so, or get soaked in white vinegar. Quite a lot goes into the trash, but I do make every effort to clean up any recyclable cans or metal and put it in with all my mixed recycling. Our town picks up unsorted recyclables every 2 weeks and I usually have way more recycling than trash. I then take the cleaned finds over to my workshop to photograph them and write the blog on my office computer. The season is winding down and it's getting too cold or wet to dig often, but I'm hoping to get out there a few more times before the ground freezes hard in December. Maine winters are brutal - they already had a foot of snow in the western part of the state. But here along the coast it's more moderate. We had snow flurries a few days ago, but I don't expect any accumulation for several weeks. I got permission to dig on a property with an original early 1800s farm house and barn that was added in the 1990s. I had high hopes for finding cool coins and relics, but so far nothing too exciting, but I'll be going back there to explore further. I found a few modern coins near where they park their cars - several rotted Lincoln pennies and 3 dimes. Lots of bits of copper and lead roof flashing and a big nail. And not shown are a steel plate about 3x5" and a 2ft long piece of steel pipe. These are typical finds around old farm houses. The interesting items are this handle that has a slot down the middle and what appears to have been part of a hinge. This looks vaguely familiar, like it could have been a handle for a milk jug and the hinge would open the lid. This tiny lead weight is interesting too, at first I thought it was a musket ball but it has a distinct hole and casting rim. And I almost dismissed this little 1.75" diameter dish because I had not noticed the fancy pattern. I think it's made of lead or pewter and bends easily. Perhaps it is doll house scale? Or maybe a decorative holder for small items. I think it is either a doll house saucer, or an incense burning plate.